This page will tell how to add unallocated space to resize hard drive when primary partition is running out of disk space on Windows Server. Download IM-Magic Partition Resizer Server to add unallocated space to fix low disk space problem on primary partition on Server 2003 2008 2012. Primary partition contains the data for booting operating system. A hard disk must have one primary partition at least if you want to install operating system on the disk. When a primary partition is running out of disk space, it may prevent you from booting operating system normally, which will lead your computer to stop working. Therefore, when primary partition runs on low disk space, you need to fix the problem. Usually, you can rely on partition software IM-Magic Partition Resizer Server to resize the hard disk and reallocate some free space to C drive. This partition software can work on Windows Server 2003, 2008, 2012, SBS 2330 and Windows Server R2, etc. Move the arrows to shrink the selected partition so that you can get some unallocated space from the partition. You need to move the unallocated space close to primary partition. Then, right click primary partition and choose "Resize/Move" option. 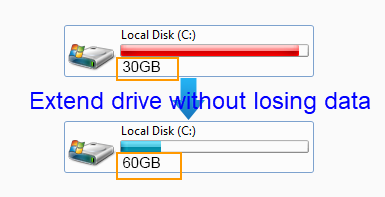 Move the arrows to add the unallocated space to the primary partition and then click "Apply" button. "I bought a new laptop. After installing operating system, I found that there is little free space on primary partition, so I want to add some free space this partition. My laptop runs under Windows Server 2008 operating system, so I open Disk Management and shrink some unallocated space form another partition. Now, I want to know how to add the unallocated space to primary partition. Can anybody tell me the solution? Thanks for any help!" "I am looking for a partition tool to increase the size of primary partition on Windows Server 2003. Can somebody recommend any useful software? The primary partition runs out of disk space and system reports low disk space warning frequently. It will be highly appreciated if anybody can give me a clue." It does not matter whether it has existing unallocated space on the hard disk, you can extend primary partition by using the professional partition software. If there is existing unallocated space on the same hard disk, you can run the software to move the unallocated space close to the primary partition and add the space to extend the partition. Even if there is no existing unallocated space, you can rely on the partition software to squeeze some unallocated space from any of partition on the same hard disk and then add the unallocated space to extend primary partition. Primary partition usually refers to the first partition on the hard disk, so C drive is also primary partition in most situations. If C drive runs out of disk space on Windows Server 2003, you can use IM-Magic Partition Resizer Server to redistribute hard disk and reallocate disk space for C drive without reinstalling system or affecting the performance of your computer. This partition software provides a safe solution for disk resizing without touching any information on the partition, so you can completely rely on this software when you encounter low disk space problem on Windows Server. If primary partition runs out of disk space on Windows Server 2008 or Windows 2012, you can open Disk Management to perform partition resizing. Disk Management enables you to extend or shrink volume on Windows 2008 and Windows 2012. However, you must make sure that there is adjacent unallocated space behind the primary partition if you want to get the partition extended. Otherwise, you can need to rely on the partition software to resize the hard disk and fix the low disk space problem on primary partition. Windows SBS shows low disk space warning on system partition? You can also rely on IM-Magic Partition Resizer Server. This partition software supports Windows SBS 2003 and SBS 2008 to work on basic hard disk and RAID 5 disk to reallocate disk space. This partition software makes it quite easy to resize hard disk without repartitioning or reformatting hard disk. 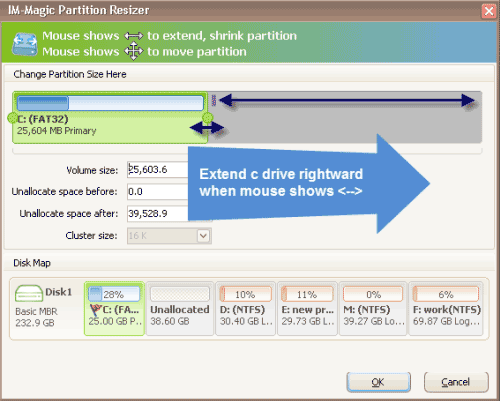 You can accomplish partition resizing in a short time by performing a few mouse clicks.